The next generation in copper-infused compression socks! Now with the benefits of bamboo! Fight fatigue, swelling and pain - without prescription drugs! Every fiber of these socks is infused with bamboo and copper to take the benefits of graduated compression to greater heights. 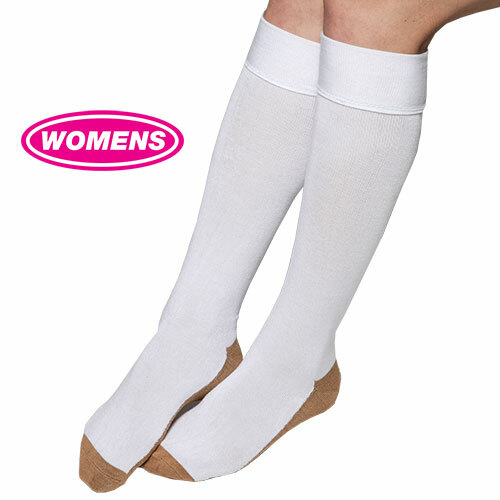 Slip them on and they instantly begin to reduce swelling, increase circulation, reduce pain and ease fatigue. The copper threads provide excellent heat conduction to surround painful areas with soothing support and warmth while the bamboo delivers natural antibacterial, antifungal and odor-reducing properties. Color: White. Women's- One Size Fits Most.